The modern light-weight design is recommended for seniors and others who may have difficulty in lifting. Although it may not boast the sturdiness of our heavy-duty Model 100 & 300 series, it produces the same quality and quantity of pure distilled water. Modern Design with Advanced Functionality. Easy operation, Refill and Reset LED indicator, Energy efficient. Light-weight, lift-out, easy-fill water holding tank with continuous water-feed valve. Process 1 gallon of tap water in approx. 5 hours. Can make up to 4 gallons a day. Distilled water begins to be produced rapidly in approximately 5 minutes. 600-Watt heating element with thermal overload protection. Automatic turn-off when distillation cycle is completed. The thermoplastic boiling tray is easily removed for cleaning and is dishwasher safe. Easier to use than a coffee maker! Just Fill and Start. Most convenient countertop model to operate and maintain. Light-weight tap water supply reservoir lifts out for easy filling without putting the entire unit into the sink as required with competitive models. Set it and forget it. Continuously fills boiling tray until one full gallon has been made, then automatically shuts off. Reduced Cleaning and Maintenance. This unit has a "stick-resistant" boiling tray to help reduce scale buildup. Also since the heating element is suspended in water, much of the scale particles drop to the bottom of the tray to be easily rinsed away. This means that you can run approx. six cycles without thoroughly cleaning, instead of having to disassemble and clean your unit after every cycle. This saves time and is much more convenient to use. This water distiller comes to you ready to use, complete with Collection/Storage Container, Activated Charcoal Pod and Anti-scale pad, (everything you need to begin making the PUREST water right away.) Counter-top unit is classic white to match other kitchen appliances. Note: The Model 200 is a completely different design than our much-admired Model 100 and Model 300 series. Customers seem to like it’s convenience and ease of operation. Instead of a one-gallon stainless steel boiling chamber with the heating element under the tank, (as Models 100/100SS & 300/300SS have), the heating element on the Model 200 is inside the boiling tray and comes in direct contact with the source water. Also since it has an automatic water-feed system, the boiling chamber is smaller. The boiling tray is "stick-resistant" to help reduce scale buildup which reduces cleaning and maintenance. It also has a handy, easy-fill water reservoir which means that the main unit can stay on your counter instead of putting it into your sink to refill. Attention Dental Offices: Model 200 is used by many dental offices. 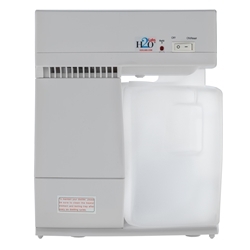 However, Model 100 is the preferred water distiller to make distilled water for autoclave use, and for that reason we highly recommend the Model 100 over the Model 200. Our automatic systems are also excellent choices for dental office applications. As with any water distiller, never use activated carbon pods or filters when making distilled water for autoclave use. Material: ABS (Interior components are heat resistant, food grade plastics). Collection container is Food Grade, BPA-Free P.P. (polypropylene). I have been using the Convenient Easy-Fill 200 just about everyday, all day for two years now. What a great product. When mine finally gives out I'll be back in line ready to purchase another one. +++((UPDATE))+++ I originally purchased mine in 2012, and after six years and almost 1500+ gallons later mine finally gave up the ghost!!! Six (6) years!!! 1500+ GALLONS!!! Great Product!!! I'm ordering another!!! It definitely cleans the water. One reviewer was worried because it didn't leave much residue. I think some folks have more lime than others. Definitely my water has tons of lime (we also have well water). After 5-7 gallons of distilling, I have to soak the heating element for several hours to remove the lime. It's kind of a pain because you have to scrub the element intermittently with a little (non-metal) brush to assist in removing the lime and then soak it some more. I was kind of glad when the element kicked the bucket (14 months of use) then I had a good reason to order the 100 or 300 unit. I opted for the 100 unit. It's so great not having to mess with the element! So, with the exception of the lime encrusted heating element, the unit worked great for 14 months. I used it alot because I have 7 AeroGardens growing year round & they require distilled water. I wasn't about to haul 7 gallons of water from the store every week! I would have given 5 stars if it wasn't for the crusty element. If you're trying to decide which type of unit to get & you can afford the 100 or 300 unit, go with them, you won't be sorry. NOTE: The customer service has offered to fix it because it was so close to warranty & they felt it should not have died so early. That is real decent of them. There does not seem to be very much residue left behind. It has me a little concerned as to the effectiveness of the unit. Also, my electric bill doubled upon the regular use of the unit. That is very disappointing. I didn't expect it to be so inefficient. On a more positive note, the water, when finished, seems to be clear and pure. It comfortably makes 2 gallons a day, which is more than I need. I am interested in obtaining another charcoal filter, and the availability of a new flitering pad for my unit. Please feel free to update me. I changed that setting, so expect to hear from you. It is so wonderful to have clean and pure water to drink. No longer do I have strange "floaties" swirling around in my water glass. Our water was so bad looking that I bought special water when we had company. Even the ice cubes made from our water looked like they had miniature cotton balls floating in our pitchers of water. We have our own well that serves our home. After I used the distiller for the first time I could not believe what I had been drinking for years. The heating element was pure white and the pad had hard debris all over on it. I have to clean the pad after every use. I have used it twice but the pad is so hard and stiff that I soak it in vinegar water and wash it after every use. I have ordered an extra pad so that while one is soaking I can make another container of pure water. We are very happy and thankful to have a way to clean water to drink. I live in an area of Utah that is very cold in the winter and the forced air heater dries the air in the house. I keep 2 humidifiers running at all times. Buying distilled water in the store becomes very expensive since I go through about 3-4 gallons of water a day. I looked into distillers and found the model 200. I made the purchase and have been using it almost 24 hours a day since. It is a fantastic machine and I recommend it to anyone needing to make their own distilled water. I will tell you, follow the cleaning instructions and you will have no problems. I let it soak in white vinegar for a couple hours after making 6 gallon by filling the tray and setting the unit back into the tray to soak the heater element. After a quick rinse, it is back up and running with ease! I have updated this review after getting more experience with the distiller. I bought the model 200 a few weeks ago and have made about 25 gallons of water with it. It works well. The most amazing thing about this machine is that most of the minerals left behind from the distillation drop out as little flakes that you rinse away. This is a major plus – but see below. I have been monitoring the water quality with a laboratory conductance meter, which measures in units called micro-Siemens (uS). For reference, ultra-pure laboratory-grade water is 0.06 uS, the best commercial distilled water is 1 to 10 uS, and my hard tap water is 450 uS. The water I get out of the model 200 was initially about 100 uS but soon dropped to 10 – 20 uS as the parts of the still got cleaned up by the water. This is good! I found that the product was much worse (100 uS) when I forgot to rinse out the water tray before running the machine. This distiller makes warm air and fan noise. I would not want to be in the same room with it for long, but running in a kitchen overnight would be fine. Since it’s summer now, I have been running it outside, underneath a small awning. It gets splashed with a little water when it rains, but that doesn’t cause problems. In the winter, I’ll bring it indoors. One reviewer below calculated an energy cost of 30 cents for a gallon of distilled water. That’s not quite right! During heating season, all the power used by the distiller eventually diffuses into the air, reducing your home heating cost equivalently if it is indoors. During heating season, the energy cost of this unit is approximately zero. After further use, I have two tips for users: 1. The heating element does get covered with lime scale. I tired soaking in vinegar for a while, and this helped a little bit. Then I soaked in vinegar for 12 hours, and the heater came out clean. The minimum soaking time is somewhere in between. It’s important to keep the scale down, or the heater could get too hot. 2. I rinsed out the infrared pad as directed and was disappointed to find that the first few gallons of water produced thereafter had very high conductivity – 150 uS. The water quality gradually improved again. It occurred to me that handling the pad must have left finger oils behind, contaminating it. So, the next time, I was careful to use latex gloves to touch the pad and other parts. Sure enough, the first gallon produced after cleaning had conductivity below 20 uS. The lesson is clear: don’t touch the wetted parts with your bare hands during cleaning. This is a great product. So easy to use. Love it!! I bought the Model 200 so I could make my own bottled-sparkling-flavored water rather than buy them from the store. The brand I buy adds salt to their product so I'd be cutting out 100mg of salt a day just from drinking my own flavored-carbonated water. This distiller does exactly what the product description says it does. It'll make four gallons of distilled water in a day. You will get a bitter taste and odor from the finished product if you don't use the included carbon filter and even if you do use the filter there still may be a hint of bitterness to the water. The instruction book mentions the taste is from VOCs that could not be removed by the device during the distillation process. I understand that almost all consumer distillers are unable to remove the VOCs without using a carbon filter. I've come to accept having a little bitterness in the water as being part of the finished product. Please note that some people may not detect the bitter taste but that doesn't mean the compounds that create it aren't still in the distilled water. Electricity costs in CA to run this unit for a full cycle to make 1 gallon of water is cheaper than buying distilled water from a store but that doesn't include the price of the distiller and the added expense of replacement filters and infrared pads. Here's some of the math I did for costs: 1 bottle of distilled water from local drug store in CA: $1.30 + tax Electricity costs in my area of CA: $.10 kWh Daily energy consumption for 1 gallon of water: (Wattage × Hours Used Per Day) ÷ 1000 = Kilowatt-hour (kWh) consumption (600 Watts x 5 hours)/1000 = 3kWh used per gallon Electricity cost per gallon: 3kWh * $.10 per KwH = $.30 So I save $1 per gallon of distilled water over buying it in the store. I plan to make at least two gallons of distilled water a day: Store bought: $2.60 ($1.30 * 2) + tax Home distilled: $.60 ($.30 * 2) Buying distilled water from a store for a year: $949 ($2.60 * 365) + tax Home distilled for a year: $219 ($.60 * 365) This does not factor in the actual cost of the unit or the cost of the tap water. I pay a flat monthly amount to my county utilities company for water and sewage so I don't include that cost in my water consumption. I just include electricity costs. If my math is right you'll notice that the distiller pays for itself well within six months of ownership. Now calculate the costs of the distiller's consumables: Charcoal filters (6 pack): 18.00 Anti-scale pad and clip: $10.00 Each filter is good for 30 gallons so I'd use 2 filters a month: $3 per filter * 2 = $6 a month in filters I'd need to buy a new pack of filters every 3 months or 4 packs of filters a year = $72 in filter costs a year. Also figure in buying one anti-scale pad a year and my cost to run the distiller for a year breaks down like: $219 for electricity $72 for filters $10 for anti-scale pad --------- $301 a year to make 720 gallons of distilled water The cost is still 1/3 the yearly cost to get store-bought distilled water. I've seen some crazy looking distillers on the internet and I'm sooo happy I purchased this. VERY easy to use and I couldn't be happier. The carbon filter insert stopped working after a month but I find I don't need it. I put through a Britta afterwards but the water tastes fine to me without. You may wish to purchase an extra pad barrier as the flouride eats it away after a couple months. I LOVE THIS PRODUCT and feel it's the best thing I could have done for myself!